Need Bird Control In Perth? Birds can be nasty critters and hard to control at times. Places that have large open bay doors and warehouses can suddenly find themselves as a new nesting area. And, this can cause all kinds of damage to the building as well as the product housed inside. Bird droppings can get rather messy rather quickly. Sometimes they will find their way into the barns and garages and they just make one large mess. But, how do you clean them up? After all, many times they are in the rafters that are high up there and not somewhere the average homeowner wants to attempt to reach. That's why you should call us. 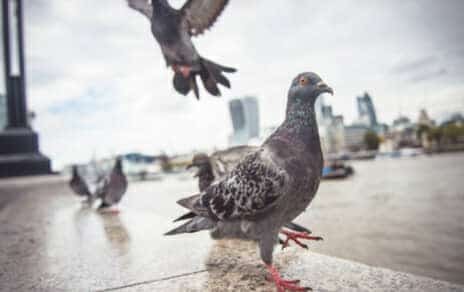 Pigeons can be filthy animals, their nests and dropping can clog up roofing drains and mess with ventilation systems. Their droppings are acidic and will erode away the roofs substrates. Because of the acid in bird waste, it can ruin cars and equipment such as air conditioning units and siding. They are very damaging animals and we have our ways to stop them. Keep the area clear of food scraps. Birds love to be where there is people food to be had. If you have a large dumpster, ensure it is enclosed so the birds cannot get in. Clean up Debris-This makes for great nesting materials and that means more birds. So, clean up leaves and natural nesting materials that accumulate. And this will make your property less attractive to the birds. Remove Access Points, adding deterrents, seal up holes and make sure you make window ledges and places that birds like to hand out in, less attractive. For window ledges, add a plant or something that is hard on their feet to stand on, as an example. What are some indicators we have a bird problem? Some of these are pretty obvious, do you have a flock of birds hanging around at all times? Is the rooftop lined with them or the wires have bunches of birds on them? However, taking control at the first site of the there might be an issue helps keep this process less costly and the cost of repairs from them down. The sidewalks and lawn area have nesting materials floating around on them. This means that there are nests somewhere being built. There are signs of stock damage or building damage that appears to be due to a bird. This is common in large warehouses and shipping docks. If there is a concentration of waste in a certain area, you certainly have a bird problem. They love to sit and stand in the same areas which causes a huge bird waste build up. You hear the baby birds. Baby bird cries are pretty distinguishable. If any of the above sounds like you, give us a call. We offer very humane ways to get the birds to leave. Our methods are approved to use in Western Australia and we follow all the laws regarding birds. We work with residential pest control as well as commercial pest control. If you have a bird problem, we can get them out.